The Setup: 12 Girls. 48 Hours. Berlin! Stay: it's a no brainer, for larger groups go with AirBnB! 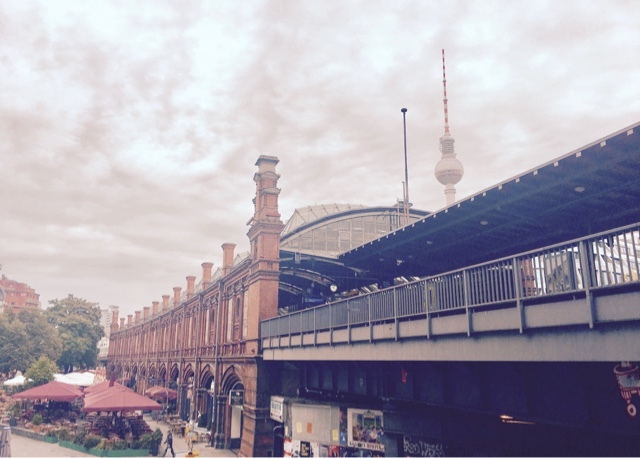 We stayed in Mitte, just across from Hackescher Markt station. 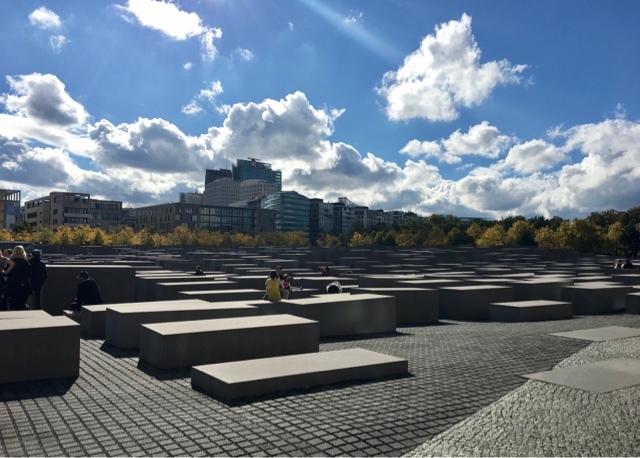 Great location, walking distance to the Museum Island, Alexanderplatz and even Brandeburgischer Tor, if you are up for a bit of a longer stroll. We got two flats with an interconnecting door that turned them to one massive space with six bedrooms and two chillout areas! 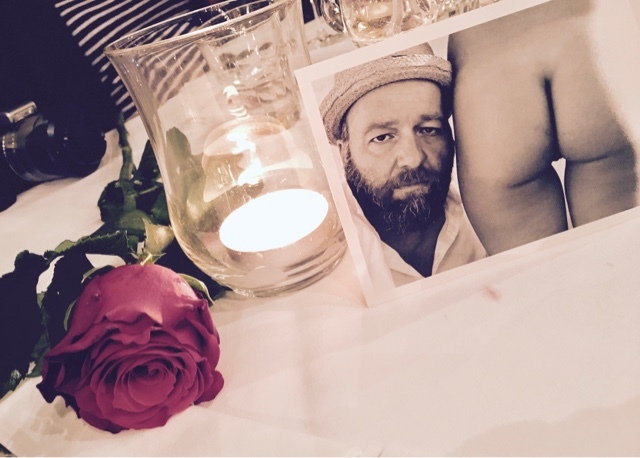 Bistro dinner: at Wiener Beisl. It is now getting colder, but back in October when we visited, temperatures were still mild and we ended up having dinner outside, amongst the hustle and bustle of the city! This is an elegant Viennese-style bistro, with checked black and white floor inside and white-dressed tables, outside. A grown-up place in other words, where we shamelessly decided to play "never have I ever", got the waiter to join in and embarrassed ourselves, as well as everyone else around, appropriately. Good fun! The food here is interesting too, I got the Ravioli stuffed with Black Pudding, it was rich and heavy and delicious! This sums up our dinner at the Wiener Beisl, make what you want of it! Hachescher Markt Station from our AirBnB balcony. 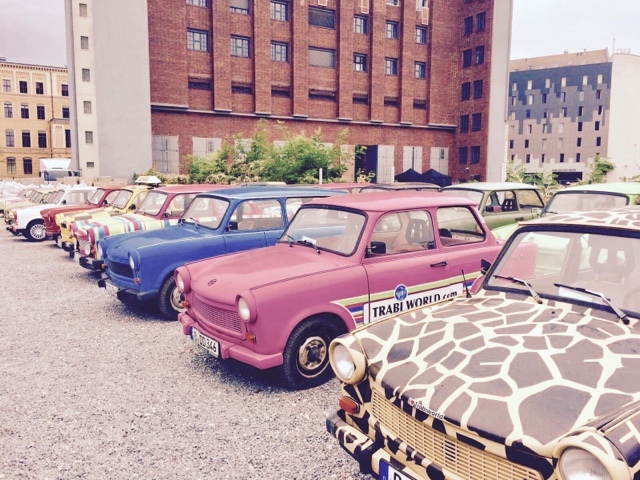 During the Day: Trabi Tour! It's So. Much. Fun! You must have a go! I was a bit worried driving a manual car, after more than a decade of driving an automatic and what's worst...a car that's 50 years old! We had 4 Trabis amongst the 12 of us, with a guide in the front car that kept our little convoy in check, at all times, through a one-way walkie-talkie system. 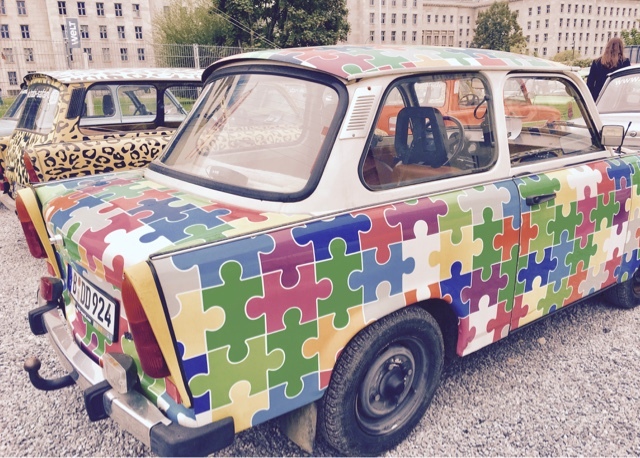 The Trabi is like a time-capsule: from having to push the manual choke like a lunatic to start the car, to simpler things like no electric windows, windscreen wipers or seat belts. I am certain that we even got a bit high on fumes, as the more these little mean machines smoked away, the more we giggled for no apparent reason whatsoever! 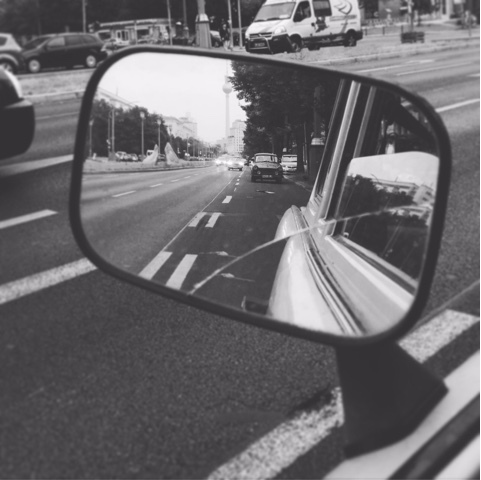 Heute bin ich auch ein Berliner! What an experience, driving an old Trabi! For "a sausage and a beer" lunch: Mutter Hoppe in the Nikolaiviertel. 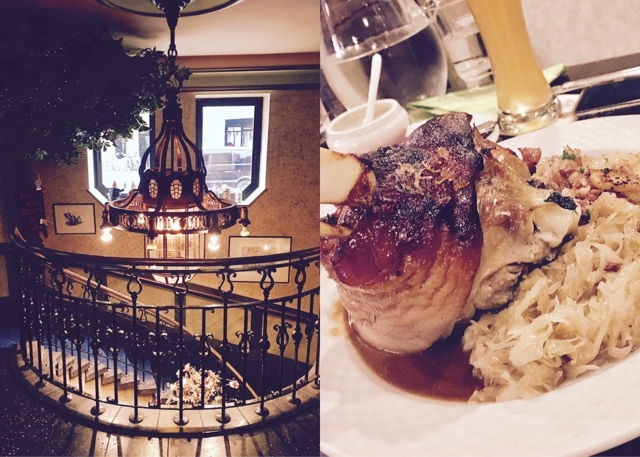 A traditional basement restaurant with a huge menu to choose from: Sausage and Sauerkraut galore to massive Lamb Shanks with smooth mash and Gulash with Cinnamon-spiced Red Cabbage! Trabant: Colourful little mean smoke machines! Dancing: at the Felix Club. 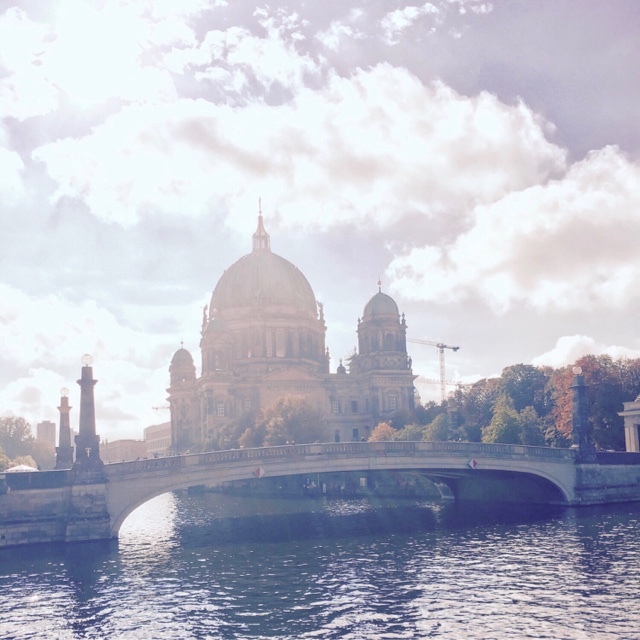 You'll find it adjacent to the American embassy, right across from the Brandenburger Tor. Very central in other words. We didn't have to pay to get in as we had put our names down on the guest list. Upmarket place, good mix of music, massive dancefloor with a wrap-around balcony on a higher level and my favourite feature: a moving platform spraying water-mist over the dancefloor - handy for a refreshing spritz when the techno vibes kick in! I was not impressed with the staff attitude though! They wouldn't give us a table all night, even though we were happy to pay the 50 Euro per head charge, why? To our astonishment, we realised that it's because we were girls! Now, let me tell you that we are all seasoned travellers who know how to look after themselves - so we had a blast regardless and dismissed the whole attitude, but such a disappointment at this day and age! 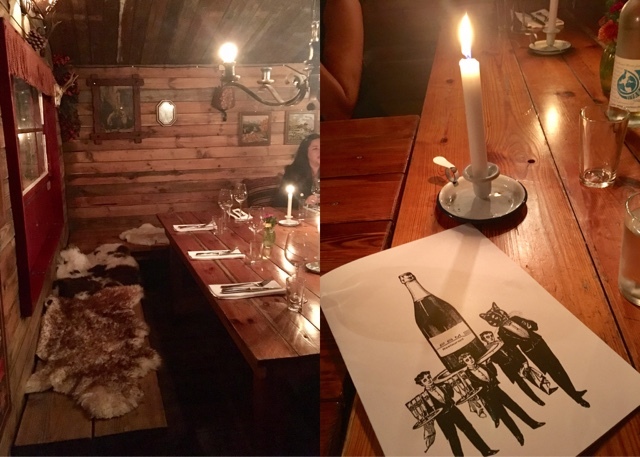 Dinner in an Alpine wooden cabin? Yes please! Head to the Fame Katerschmaus, on the East side. A crack on the wall under a railway bridge, next to a highway, serves as the entrance to this place. "Why did I get dressed up for?" comes to mind. Wait! This is a an uber-cool, hipster joint with a massive river-side terrace for sunny days and a wooden Alpine-style lodge, for colder days, which we had all to ourselves, complete with private service; dinner, drinks and fees came to 70 euros per person - impromptu singing, advisable - why else would you need a private cabin for? 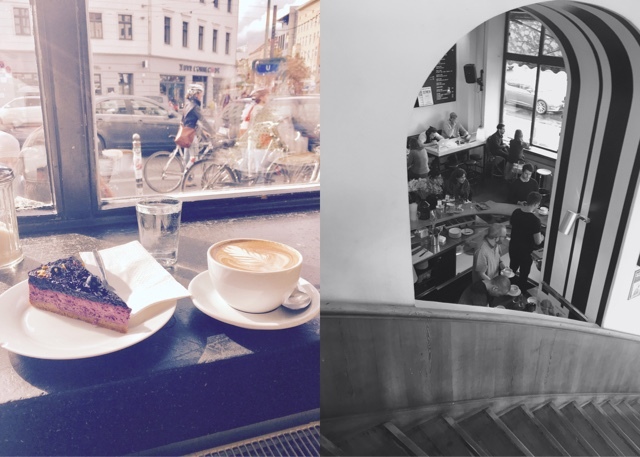 Sundays are for coffee at the Sankt Oberholz, in Rosenthaler Platz. This was my favourite spot. Apparently it's one of the cool, independent places for a good coffee and a lounge-y Sunday session with you laptop. Yeap, after failing to visit the Pergamon museum, having queued for 45 minutes only to be told that my hand-luggage couldn't be stored, this is where I chose to camp and watch the Berliners go by, with slice of cheesecake and a smooth cup of Kaffee! Sunday staples at St Oberholz. Danke Berlin, will be back soon!